The first brisk fall evenings crash through summer’s warmth and abruptly awaken our senses to the season’s arrival. It seems like one day we are enjoying long days and cookouts, and the next day it’s football and early morning frost. Those crisp nights also tend to foretell the end of our gardening season. 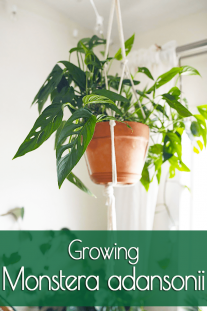 Less hardy plants start to wither up and die and your garden starts to turn brown. The thought of all your hard work disappearing steadily with each falling leaf, though inevitable, is a disappointing end to the summer. 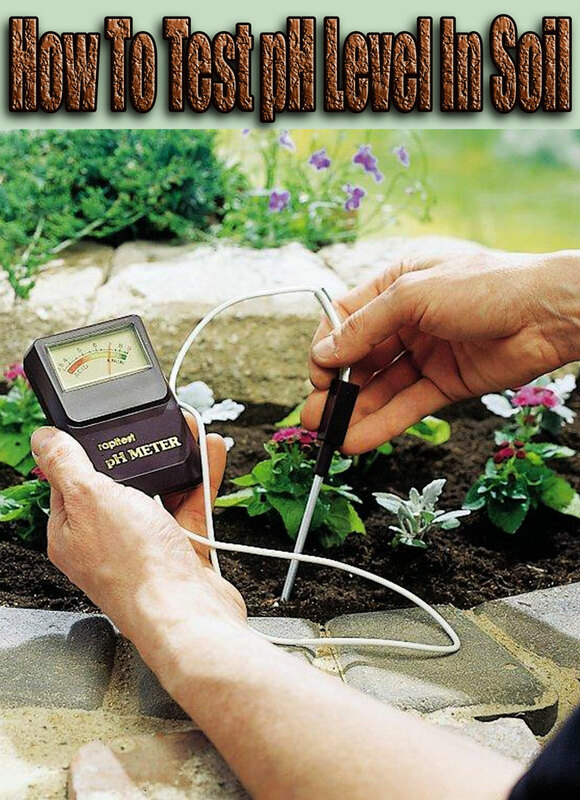 So don’t let it be the end of your garden season! 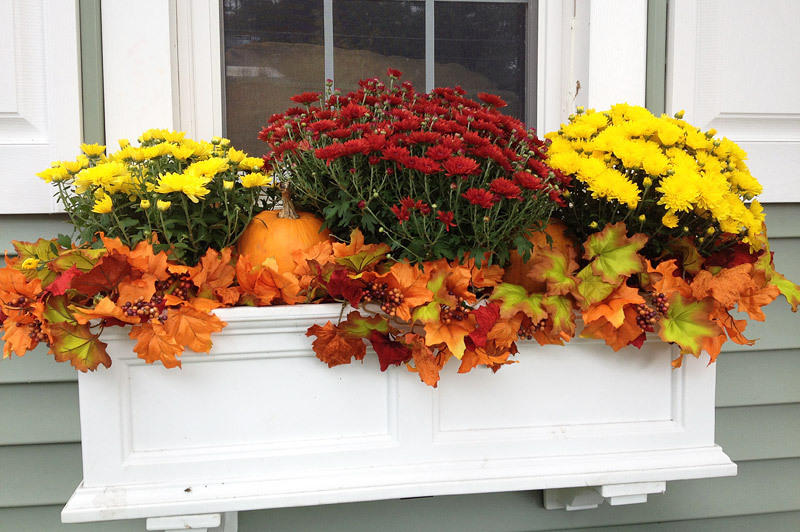 Take back the fall with your flower boxes and hanging baskets, because they are a great way to extend your gardening season past Halloween and even continue to have garden color into Thanksgiving. Once your summer annuals are done blooming, it’s time to start to research some plants and flowers that will last a little longer in your hardiness zone. Don’t forget that there are some plants that will look great in your flower boxes even after the first frost, and will provide color late into the year. 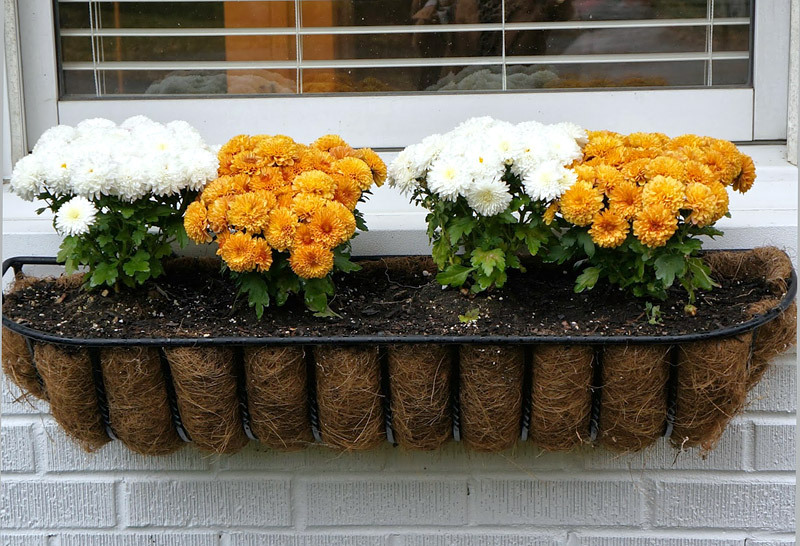 Mums are a very common and colorful fall flower. There are many different varieties available to today’s gardener, including some very hardy plants that can be perennials all the way in to Zone 5! 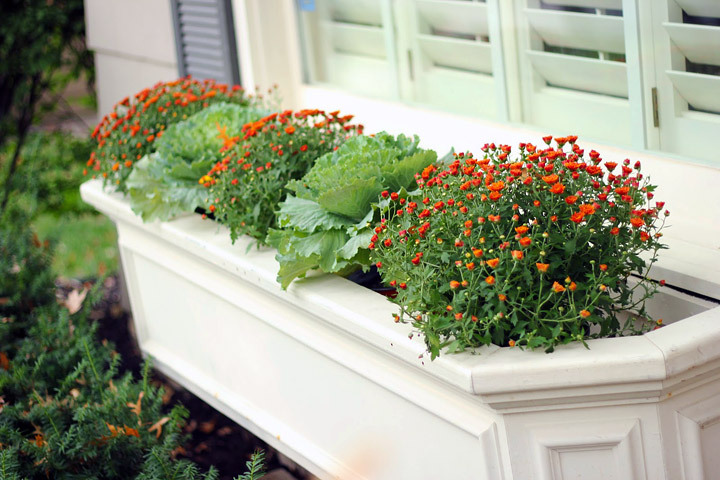 Mums also make excellent container plants, and will work superbly for a flower box. Select 2-3 different colors to provide a nice, diverse showing. If you prefer, use a palette of fall colors like orange, yellow, and dark-red. They match up with your traditional Halloween and Thanksgiving decorating. Pansies are an excellent way to add some vibrant color to your fall flower boxes. While pansies are not hardy enough to last as perennials in winter zones, they thrive in the cooler weather that fall provides, with some varieties even being able to survive light snow. The incredible color variety that is available with pansies, make them a great option for filling in empty spaces in your flower boxes or hanging baskets. 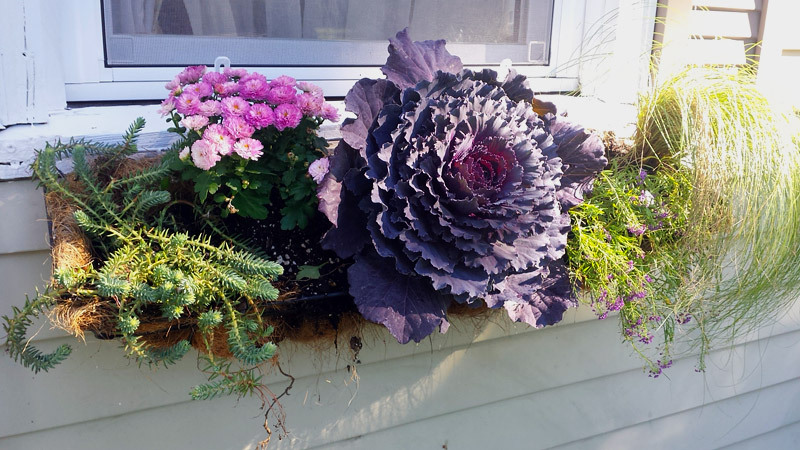 Ornamental cabbages and kales provide nice leafy centerpieces in which to build your fall flower boxes and hanging baskets around. There are a handful of different varieties, all with different shapes and sizes. 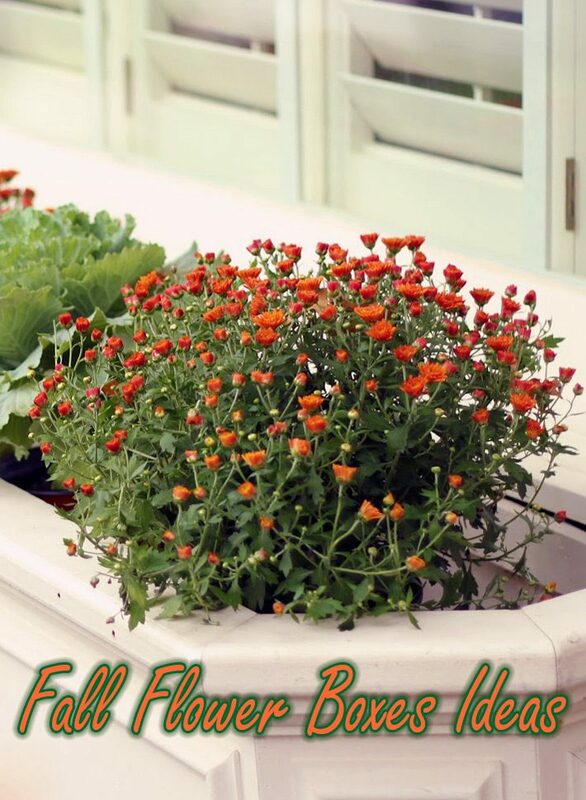 As the weather gets colder the color in the center of these plants become brighter and really provide a nice base of color for fall flower boxes and hanging baskets. Don’t let fall be the end of your beautiful gardens. 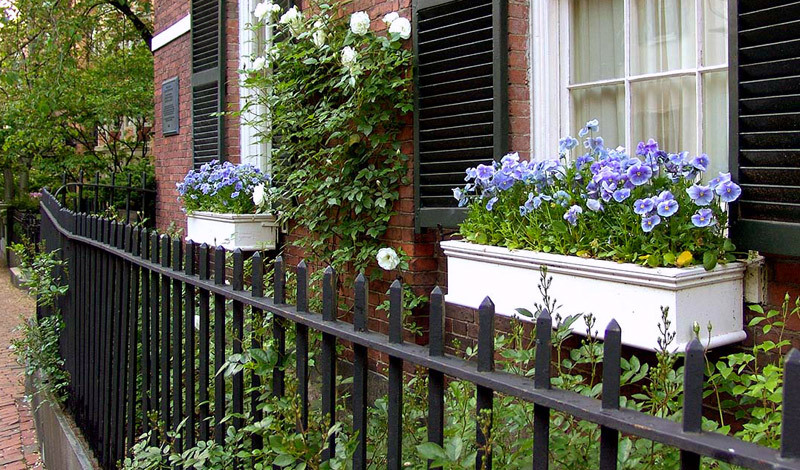 With a little research, and a little extra care, you can have flower boxes and hanging baskets that will extend your growing season, and give your outdoor decorating an extra touch of color and beauty at a time of the year when most people have given up.